"With fossil fuels driving a climate crisis around the world, it’s time to speak up as one planet. 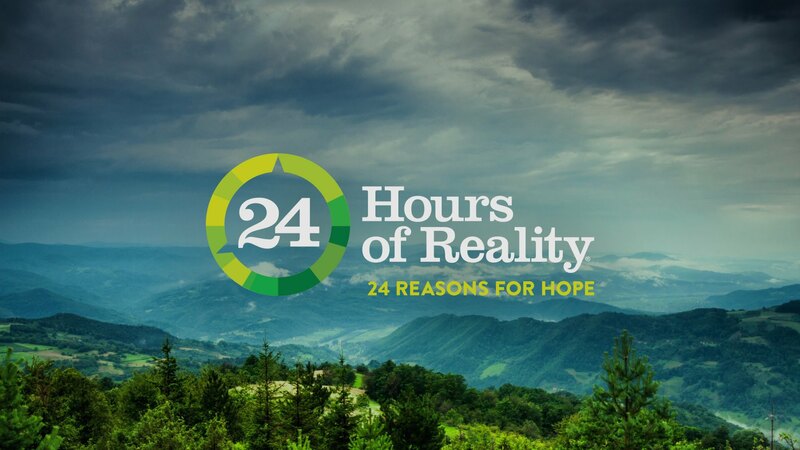 On December 4-5, join former Vice President Al Gore, Climate Reality, and an all-star cast of artists, thought leaders, business visionaries, politicians, musicians, and more for the global broadcast event 24 Hours of Reality." The Carbon Free Group is calling on UK businesses, organisations and individuals to watch and share 24 hours of critically important Climate Reality broadcasts which will be live and online at 24hoursofreality.org from 11pm on 4th December (GMT). The broadcasts are being led by former United States Vice President and Nobel Laureate Al Gore and will be delivered by a range of high profile speakers including politicians, business leaders, musicians and celebrities. Big names include: musicians Belinda Carlisle, Billy Bragg and The Killers; actor Helen Hunt; and Dr Klaus Schwab, executive chairman of the World Economic Forum. empower leaders to take action. The Climate Reality Project was founded to empower the social revolution for climate action. It has millions of supporters worldwide. This latest high-profile broadcast event is intended to help millions more understand the challenge and the role they can play in delivering change. These messages align perfectly with The Carbon Free Group’s mission to ensure knowledge on the issues and solutions is accessible to all, to accelerate decarbonisation, especially in the energy and built environment sectors. By doing so, the Group will help tackle climate change by driving down carbon emissions. Find out more about The Carbon Free Group's decarbonising smart construction project, Atelio. "We encourage all to tune into this broadcast. Everyone needs to understand the climate challenge and the opportunity. "It is especially pertinent for those that are developing infrastructure and communities. For example, we believe using offsite, rapid, modular, ‘smart methods of construction’ such as Atelio is fundamental if the UK is to achieve its target of 200,000 new homes a year while still reducing carbon emissions. "These live broadcasts aren’t about money or support – just time. You don’t have to tune in to the full 24 hours - if it’s only a half hour, that’s a start. "If enough people around the world switch on to these globally critical broadcasts, we can speed up positive climate action.